With DUO, brake lights and deceleration are required so false or unwanted activations are eliminated. In addition, with two signals necessary to activate, there is no need for the delay technology found in all the box brakes. The Stay-IN-Play DUO is truly an improvement in towed vehicle brake systems. Simple to control, easier to use, and the smallest actuator in the industry. Number one choice for gas powered rigs. 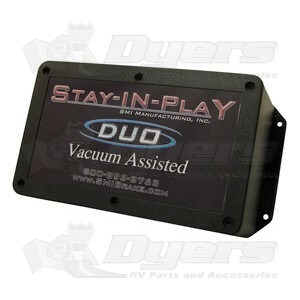 The Stay-IN-Play DUO supplemental-braking system is installed so there is no set up required for towing your vehicle. To get ready to tow you simply turn it on; that’s all. Turn it on... and tow. The DUO energizes the towed vehicles power brakes so it is gentle and consistent. No more boxes! That is the cry of our customers. The Stay-IN-Play DUO answers the cry. Duo's small operating unit is installed under the hood so you never know it is there. No messy components scattered in the towed vehicle to complicate things; just a small operating module to control the towed vehicle brakes with no physical connection to the motorhome. Activation of the towed vehicle's brakes require BOTH deceleration and the brake lights from the motorhome. Once BOTH signals are present, DUO gently applies the brakes. There is no complicated gain or sensitivity to achieve the proportionate balance of brake effort, it is all automatic. Automatically, once engaged, DUO will apply progressive brake effort in the towed vehicle. Because DUO uses both brake lights from the coach and deceleration, there is absolutely no delay. This becomes critical in a panic stop. Systems that use only deceleration must "think" first, is this a step grade, is this a large bump, or is this stopping? Time translates to feet while towing and in a panic stop, inches are important. No self contained system applies brakes faster than the DUO. "Coach Notification" is another important aspect of any supplemental brake system. Some claim to have it, but really do not; while others do not really tell you about the position of the brake pedal in the towed vehicle. Without question, the most improtant information while towing is the status of the braking system in the towed vehicle. "Are the brakes applied?" That is the question. When researching brake systems, ask the question, "Do you have coach notification FROM THE TOWED VEHICLES BRAKE PEDAL SWITCH?" Many will claim to have a signal but do not, and others will have a signal from some other source. The only reliable and complete signal must originate from the towed-vehicle's brake switch. If the light is on, the brakes are on, period. What you do not want is a problem while you are towing. Knowing the position of the brake pedal gives you that peace of mind. We call it DUO because two is better than one. First and foremost, DUO uses both air pressure and vacuum. Vacuum is created to energize the towed vehicle’s power brakes and the air pressure to apply them. Secondly, DUO requires two separate signals to activate the towed vehicle brakes. Using two activation signals is the best method for eliminating complicated electronics and control unwanted or unnecessary activation of the towed vehicle brakes. By combining the brake’s of the coach with deceleration, you have better control of the system rather than the system controlling you. We also believe that simplified electronics and fewer mechanical parts will provide you a better foundation and last longer. Another key difference in the DUO is the Coach Notification System. There is only one way to obtain reliable information about the towed vehicle’s brakes and we believe this to be through the towed-vehicle’s brake light switch. Many will argue that there is another way; that there is a better way, but if you think it through, you will agree, the brake light switch eliminates the question. One has to wonder, how many systems today are really easy to use? Many claims are made in advertising literature but is brand X really easy to use or do they just want you to think it is. DUO is REALLY easy to use, just turn it on. We make no inflated claims. You do have a two to three-hour install, just once. This is the DUO difference, install once and always ready. That is easy. If you have any specific questions or would like to know more information please contact the SMI Manufacturing 24/7 technical support team at: 1-800-893-3763. Stay-IN-Play DUO will work for both gas and diesel coaches without air brakes. I installed this myself on a Jeep TJ. The sensetivity of the braking actually changes going down hill. I pulled the Jeep 1100 miles and it was set up as described in the instructions. The unit applies the brakes under 20 mph despite the information provided in the operations manual. Also, the sensitivity changes going downhill. I went down a series of 7% grades and the toad brakes didn't apply until I nearly stood on the RV brakes. I readjusted the sensitivity to be more acceptable downhill, and then I found the toad brakes were applying with the RV turn signals.....Definately not good. I just got off the phone with the factory and their suggestion was to readjust eveytime I encountered a downgrade....Definately not convenient, and just live with the brakes coming on with the turn signals until out of the mountains.....huh?? I was going to buy a 2nd unit for my other toad, a 2014 CRV, but I think I'll just go without on the 2nd vehicle. I'm gonna set the sensitivity so it doesn't come on with turn signals, and know that I'll have to jamb on the brakes downhill for any kind of help from the toad. (downhill is when you need the most help from your supplemental braking system). I'm legal. But I'm not gonna brag about how this system works. Installed in driveway on a 2012 Jeep Liberty. Works well and Dyers had it at my residents in 3 days. Easy to install and hook up. When connecting to tow, tow bars. safety chains, break- a-way cable and brake light cable and your ready to go. I installed a LED light on dash of MH so I can see when the toad brakes are on. I installed this unit in a 2001 Nissan Frontier pickup. The most difficult chore was deciding where to locate the under hood power unit. The control box had to be placed on the doorpost behind the driver seat due to limited space on left kick panel. I especially appreciate the deactivation of the breakaway switch when the unit is switched off. The only issue was a defective breakaway switch in the kit but I did not contact SMI service because I had a new one on hand already. I would appreciate at least a wireless monitor for inside the motorhome to sense when the toad brakes are activated. The system available for purchase is very pricey. I expect a long service life for this unit. Installed this in a 2004 Wrangler. Neatly tucks away in the engine compartment ,wouldn't even know it there. Simple to put in use with a flick of a switch as well as take off line to drive the Toad. No problems with install however all reviews I have seen, agree customer service is Great. Hopefully i never need to find out! Only time will tell. Keep in mind you do need to order a few other parts to do a complete install. Wiring harness for tail lights and blinkers. For this 2004 Wrangler a isolation relay was needed to prevent brake lights from being powered by the Toad when the break pedal is depressed.